When Matt and I scanned this one we laughed at the obvious fakery, but now that I've had a chance to study it carefully I'm not so sure. I think that may be an authentic reflection of Mt. 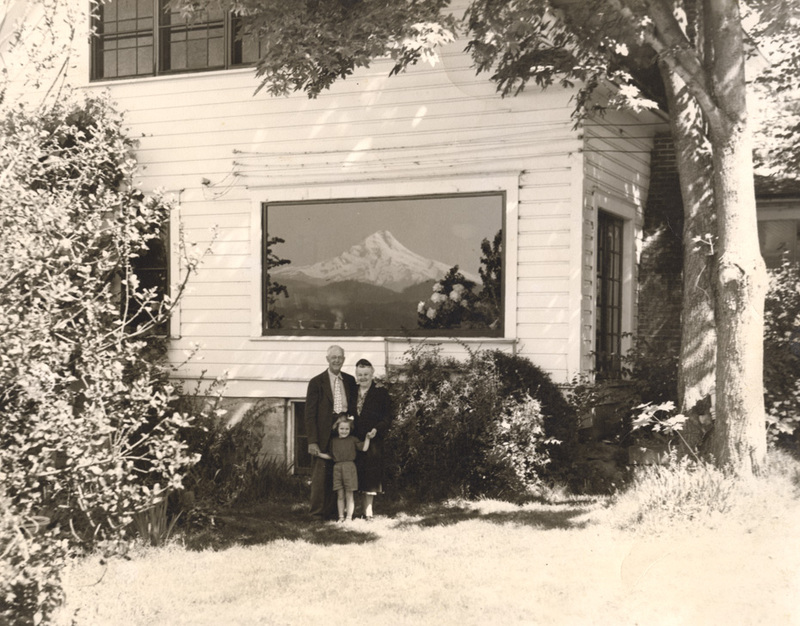 Hood in window of Edward and Mabel Lage's Pine Grove home, as they pose for a Christmas card photo with their granddaughter Betty Lou Lage. What do you think? I think it is 100% authentic. Knew both Ed and Mabel quite well. Of course his father was Hans Lage the early Pine Grove pioneer. Her maiden name was Riddell and she was a very early on school teacher at Pine Grove. One point of interest here is how the electric wires are run along the side of the house. This house was a huge old beautiful house on Eastside Road located where the Ed Lage (the grandson) home is now. They had this beautiful yard down under the big fir trees with a wonderful large fireplace (still there) and many many picnics were enjoyed there over the years. Another old beautiful home lost to modernization. Betty Lou is the daughter of Riddell Lage and Athalie (Miller) Lage. Athalie is one of the many Wells cousins in the area. That is a very large picture window and it would seem hard to fake the view of Mt Hood. Boy, I don't know. Seems like we would be able to see the trees that are on the sides of the windows, in the actual view. I didn't think they had Photoshop back then, so I didn't think it was even possible to cut and paste images. I am very skeptical because of the shrub/flowers (roses?) in the lower right of the picture window - these should appear in the foreground of the picture. Same with the branches of the tree on the left side of the window. The real test would be to stand in the same position as the Lage family and determine if you see the same view as shown on the window - except that it would be mirror imaged. Someone on here familiar with the house location should be able to verify this. Did they have large mural posters of Mt. Hood back then? Could they have put a poster over the window? Based on the multi-paned style of the other windows on the house, I would say it would be unlikely they had one large single pane picture window. If their goal was to fake a christmas card with a reflection of Mt, Hood in the window, why wouldn't they do it in the winter with snow on the ground. Plus they look like "salt of the earth" people who don't look like being flakes was part of their lifestyle. Is that smoke from a wigwam burner in the reflection? Upon zooming in, there looks to be a face in the window--lower left. Someone inside looking out?? Seems real to me. And I'm not sure what the point would be of all the work in a darkroom to double-expose... not much payoff. The 3 wires coming in are their service, which back then was probably a 40 amp panel with 4-6 screw-in fuses. Notice there's no meter! Nothing about this service would be allowed to survive today... near and dear to my heart at the moment, as I just replaced my own yesterday. Ask Athalie or Joan, they could tell yah! Athalie is at Down Manor & Joan at her home. Someone looking out? I bet it is the cameraman? It is authentic- that is my mom with her grandparents. We have an original. for those of us away from the Valley for a while, maybe a long while, we tend to forget that picture postcard views of mountains adams and hood were regular occurances......lunching on the patio at the Indian Creek Golf course in the summer is one of many, many examples....growing up our view from Belmont of mountain adams was also terrific. Jenn, WOW, what a keepsake...thanks for confirming that it is real. I can definitely state that this a true and treasured photo with my Grandparents. Of course, this home has been replaced by a newer home so it would be impossible to duplicate the reflection. My sister-in-law, Joan, still enjoys this marvelous view. That is a genuine reflection in the window. I lived there with my father, Edward Riddell Lage, Jr., for several years. The old house was replaced because the foundation was deteriorating. The estimate to repair/replace the foundation was 80% of the cost of building the house that stands there now. The new house was built to enjoy the view of Mt. Hood, and the valley, with picture windows across the entire west side, and a large balcony on the south. Pretty cool, when family members chime in on a photo and give facts. Thanks to the Lage family for a very unusual photo. The photo of the Hans Lage farm has always been one of my favorites. I played there. The picture is real.